Even though every major scale contains a different set of notes, each scale is put together exactly the same way. Knowing music theory comes in handy here. The specific major-scale pattern of intervals is what makes them major scales. Half step: Moving one piano key to the left or the right, or one guitar fret up or down. Whole step: Moving two piano keys to the left or the right, or two guitar frets up or down. Pitchwise, a half‐step is exactly 1/12 of an octave, or 1 semitone. A whole step is exactly 1/6 of an octave, or 2 semitones. The 1st and 8th notes, the tonics, determine the name of the scale. 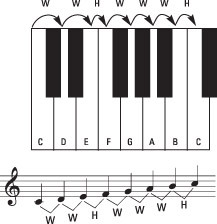 Relative to the tonic note, the rest of the notes in the scale are usually attached to the numbers 2 through 7 (because 1 and 8 are already taken by the tonic). Each of these numbers represents a scale degree, and their pattern of whole steps and half steps determine the key of the scale. The 1st and the 8th notes have the same name here because they’re the exact same note — at the 8th note, the scale repeats itself. You won’t hear a musician talk about the 8th degree of a scale — instead, she’ll refer to the 1st note as the tonic. So, for example, if you’re playing a piece of music in the key of C major, which sequentially has the notes C, D, E, F, G, A, B, and C in it, and someone asks you to play the 4th and 2nd notes in the scales, you play an F and a D. And you do the same thing if that person asks you to play the subdominant and the supertonic. Picture each scale in your head and where it’s located on your ­instrument. Know the letter name and number of each note in each scale. Be able to play sequences of notes when given the key and number. Only when you can do all three things for the 12 major scales can you stop practicing your scales. The major scale, or the diatonic scale, is the most popular scale and the one that’s the easiest to recognize when played. Songs like “Happy Birthday” and “Mary Had a Little Lamb” are composed in the major/diatonic scale. If someone were to ask you to play the scale for C major on the piano, you would put it together like this. Notice the arrow pointing to the steps — every single major scale you work with follows this pattern, using different combinations of black and white keys on the piano, depending on the scale. To play each major scale on the piano, begin with the piano key that is the name of the scale. For the A major scale, for example, you begin with the A. Then play the major scale pattern: WWHWWWH. The scale ends on the same note it began, only an octave higher. Playing scales on the guitar is even simpler than playing them on the piano. Guitarists think of the guitar neck as being broken up into blocks of four frets, and, depending on what key you want to play in, your hand is positioned over that block of four frets. Each four‐fret block contains two octaves’ worth of every pitch within that scale. Major scales on the guitar follow the pattern below, playing the notes in the number order they appear. The 8th note (tonic) of the first octave serves as the 1st note (tonic) of the second octave. To play major scales on the guitar, you just move that pattern along the neck to build whatever major scale you’d like. You determine the key by the first and last notes of the scale, so if someone asks you to play a C major scale, you simply start the scale on the 8th fret. The actual pitch of the guitar is one octave (12 half steps) lower than the ­written pitch. This discrepancy occurs simply because most sheet music is written for piano, so the notes would fall below the staff if they were accurately written for guitar. On the piano, the middle octave is the most frequently used and is therefore centered on the grand staff. If composers had to write guitar parts at their actual-sounding pitch, they would have to use too many ledger lines and the part would be confusing.